Everyone who loves candy knows that if you eat too much of it you’re likely to get sick. Everyone, that is, except the creative team behind Charlie and the Chocolate Factory, the new musical based on the 1964 novel of the same name by Roald Dahl. The confection they’ve crafted overloads on sweetness, goes berserk with frenetic energy, and then, predictably, crashes. It is, on the whole, a slightly nauseating experience. I left the theater craving a salad. That’s quite the contrast to Willy Wonka & the Chocolate Factory, Mel Stuart’s charming 1971 film based on the same source material. Stuart’s film was fun, funny and colorful, yes. But, like Dahl’s book, it also served as biting social commentary on the corrosive forces of consumerism and mindless entertainment that were becoming increasingly pervasive. But this is 2017, and at the Lunt-Fontanne Theatre, mindlessness seems to have won the day. 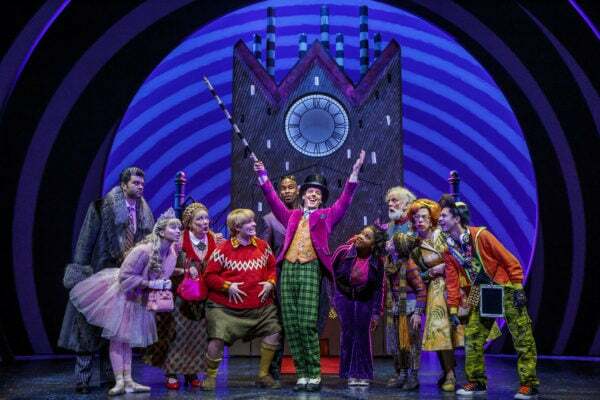 Consequently, rather than critique the bad behavior exhibited by the finders of Wonka’s golden tickets, this musical celebrates them. All are played by adults, a fact that, in this case, serves to literally supersize their antics. The television-obsessed Mike Teavee (Michael Wartella) here becomes an iPad-crazed bro who looks like he drank one too many bottles of Mountain Dew. Violet Beauregarde (Trista Dollison) is a gum-chewing Internet celebrity prone to high-pitch belting. Augustus Gloop (F. Michael Hayne) is a German cartoon character with the fat suit to match. Veruca Salt (Emma Pfaeffle) is, for some reason, a Russian ballerina. Their noxious personalities are designed to elicit wild shrieks of laughter from the audience rather than scorn, and the effort is largely successful. Charlie Bucket (Jake Ryan Flynn, Ryan Foust and Ryan Sell share the role), the only one of the ticket finders to be played by a child, is not nearly as toxic as his counterparts. But he does suffer from a sickly-sweetness absent in previous iterations of the character. Peter Ostrum, who played Charlie in Stuart’s film, is a breath of fresh air, a subdued figure standing out from the high-octane riffraff. But here, Charlie’s cloying goodness screams as loud as Beauregarde’s self-obsession and Salt’s authoritarianism. Grandpa Joe (usually played by John Rubinstein, but played by Paul Slade Smith at the performance I attended) is equally over-the-top, imagined here as slightly delusional and overly eager to crack jokes. Christian Borle, as the famous chocolatier himself, proves the exception to the rule in this production. His grounded performance of Wonka mercifully preserves some of the character’s sly sarcasm and winking playfulness. His rendition of “Pure Imagination,” free of any unnecessary doodads, is one of the best moments of the show. A few more gimmicks, on the other hand, would have been welcome in Mark Thompson’s simplistic scenic design. The Bucket home, a quirky, rickety-looking contraption is his finest piece in the show, but Wonka’s factory is glaringly lacking in magic. When the “Chocolate Room”—a miniature enclosed in a strange cube frame—was first revealed, I had to do a double take. It looked like an elementary school diorama. The rest of the factory, likewise, is revealed only in small suggestions, leaving much to the imagination. In this one area, maximalism could have served well. The new musical numbers written for the show by Marc Shaiman, with lyrics by Shaiman and Scott Wittman, are largely forgettable. “Strike That, Reverse It,” whose title and central lyrical theme is borrowed from the 1971 film, is one of the more inventive additions. “The Oompa Loompa Song” (written by Leslie Bricusse and Anthony Newley) meanwhile, serves only to open up a can of worms. Dahl was rightly criticized for depicting the Oompa Loompas as African pygmy people in early editions of his novel. The 1971 movie turned them into little people with orange skin and green hair—only slightly less problematic. But Bricusse and Newley’s song, which tells the backstory of Wonka’s jungle “discovery” of the Oompa-Loompas, brings the thorny issue full circle. Any modern adaptations of Dahl’s text should veer sharply away from his colonialist fantasy. This one dives right into the same tired narrative—a disappointing but not altogether surprising mistake in this misguided production.